In turbine blades and other applications where lightness and strength must both be abundant, balsa wood has been the gold standard material. The fast-growing wood is exceptionally stiff for its low density due to its microscopic mix of cellulose and lignin fibers. Balsa wood has its drawbacks, though: 95% of the world’s supply comes from Ecuador, and it’s getting increasingly expensive as the demand rises for high strength, low density materials. Controlling the orientation of these fillers allows the researchers to duplicate the strength of balsa wood without its occasional natural structural defects. 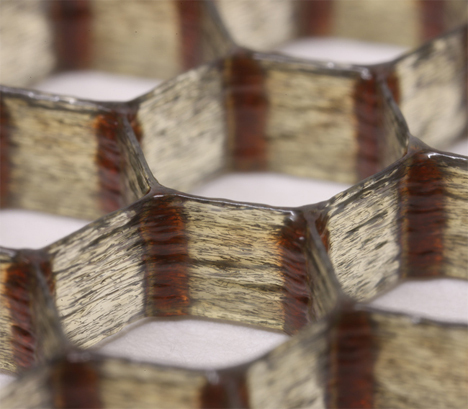 The resulting composite materials are up to 20 times stiffer than the standard 3D printed polymers most commonly used today, and twice as strong as the strongest 3D printed polymers used thus far. The novel makeup of the printed structures will allow for much lighter wind turbine blades, car chassis, and aircraft that are just as strong as – if not stronger than – any currently manufactured. See more in New Materials or under Science. July, 2014.